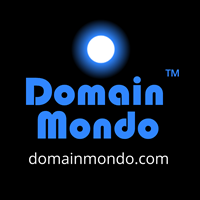 Tech Review (TR 2018-11-10)--Domain Mondo's weekly review of tech investing news with commentary, analysis and opinion: Features • 1) The Google Monopoly, 2)Credit Card Chips & Fraud, 3) Investing: The Week, Investing Notes, 4)ICYMI Tech News: Amazon, Apple, Alibaba, Crypto. 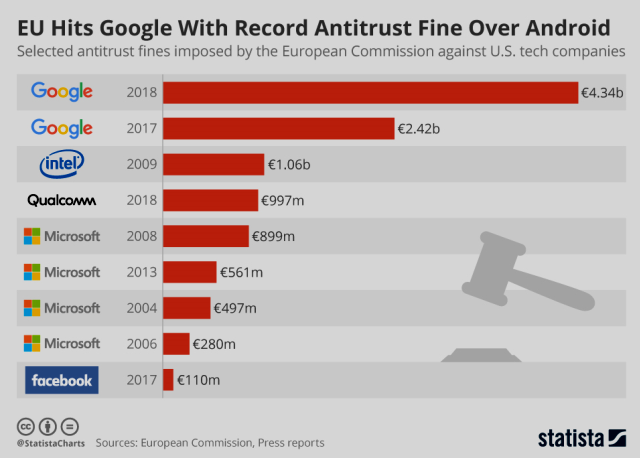 CNBC International video above published Nov 1, 2018: Google has been fined record-breaking amounts by the European Commission for violating antitrust rules. 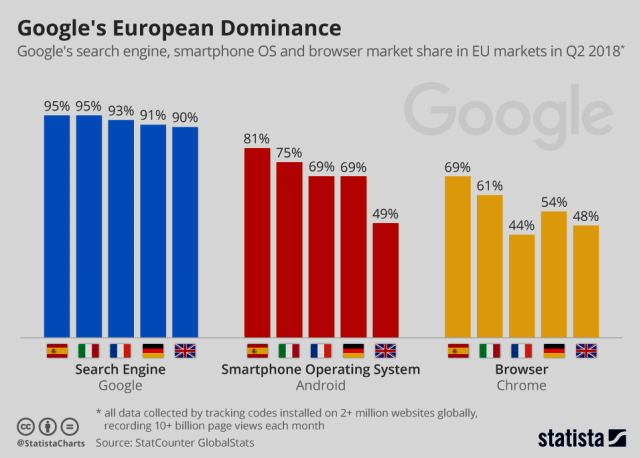 Is Google a monopoly that needs to be broken up? CNBC’s Elizabeth Schulze explains from Brussels. See also: The New York Times is digitizing its 5-7M photo archive using Google AI to recognize text describing the photos and will use Google's storage services--cnet.com. 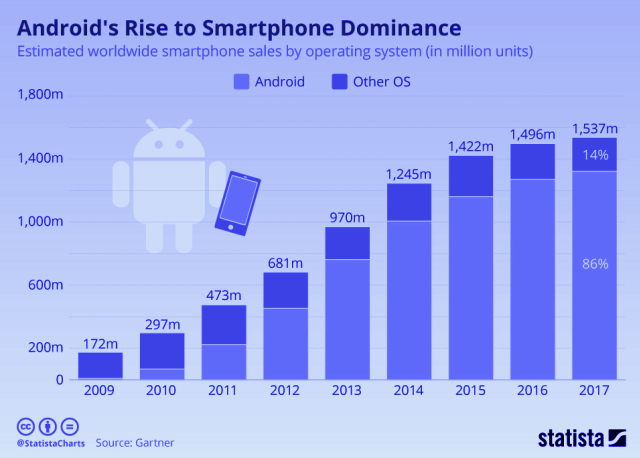 Charts above courtesy of statista.com. Fortune.com video above published Nov 5, 2018: Credit card chips fail to end fraud according to a new report. The NASDAQ Composite is up 503.51 points, or 7.3%. The S&P 500 is up 107.40 points, or 4%. The DJIA is up 1,270.08 points, or 5.1%. Apple, Microsoft, Amazon, Google and Facebook have a combined market capitalization of $3.7 trillion, equal to Germany’s gross domestic product (GDP) last year--Tim Berners-Lee says tech giants may have to be split up--reuters.com. Buffett's Berkshire doubles profit, repurchases $900 million stock in third quarter--reuters.com. Move over Netflix: Disney says its new streaming service will be called Disney+ and will launch in the US in late 2019--cnbc.com. Goldman Sachs ensnarled in vast 1MDB fraud scandal--NYTimes.com. Hilarious How Wall-Street Crybabies Whine about the Fed’s QE Unwind after a Decade of “Wealth Effect”--Their “Everything Bubble” is being pricked “gradually,” and they don’t like it.--WolfStreet.com. Amazon $AMZN is spending billions to win Indian shoppers--bloomberg.com. Also: Amazon plans to split HQ2 evenly between two cities--wsj.com; Amazon.com Inc. said effective Nov 5, it would offer free shipping with no purchase minimum for the first time, this Christmas shopping season--reuters.com. Apple $AAPL: India iPhone sales to fall for first time in four years: researcher--reuters.com. Amazon signs a deal with Apple--cnet.com--will start selling its latest devices, except the HomePod, in the US, UK, France, Germany, Italy, Spain, Japan, and India. Alibaba $BABA cuts sales forecast on economic uncertainty, trade fears--reuters.com. Alibaba Singles Day Nov 11, a major shopping extravaganza in China--cnbc.com video. China's leading self-driving startups are betting on leveraging talent and capital in Silicon Valley--axios.com. Tech CEOs Are in Love With Their Principal Doomsayer--The futurist philosopher Yuval Noah Harari thinks Silicon Valley is an engine of dystopian ruin. So why do the digital elite adore him so?--NYTimes.com. Crypto: Policing the Wild West of Cryptocurrency--morganlewis.com. See also Bitcoin: New Asset Class or Pyramid Scheme? | cfainstitute.org. Personal Tech: a. New MacBook Air threatens both MacBook and MacBook Pro with function keys--appleinsider.com; b. Files by Google: Clean up space on your phone--Google’s Files Go hits 30 million users and is getting a new name--theverge.com.